The next few days I am going to have a look at the names we give to the days of the week. These names demonstrate the profound effect that the Germanic and Anglo-Saxon mythology had on development of western culture. Of the 7 days of the week all but one of them relates to a Old English/ Norse / Germainic god or godess. Because they are linked (as we will see in a moment) I will start with Sunday and Monday together. The old English name for Sunday was sunnandæg (“day of the sun”). All the Germanic and Scandinavian words have the same root. The Old English name for Monday was mōnandæg (“day of the moon”). The Germanic people who developed these names were not just thinking of the physical sun and moon. 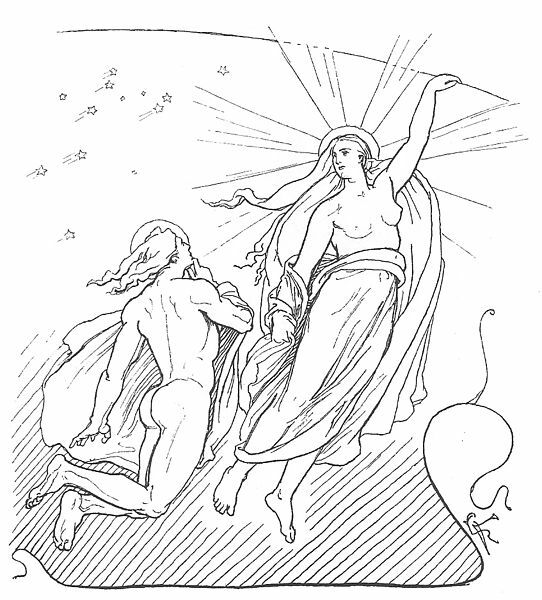 They believed in a goddess Sunna who carried the sun through the skies behind her chariot. Sunna’s brother was Mani and it was he who carried the moon through the night skies. The sun and the moon are always in motion and Sunna and Mani can never rest for after them, galloping through the clouds are two wolves. Scholl is the wolf that chases after Sunna and Hati is the wolf which pursues Mani. At the end of the world – at the time of Ragnarok the wolves will catch up and devour the sun and the moon. How do we know these stories? The stories are recorded in the Edda and other Scandinavian poetry/. Further more statues of the sun on a chariot have been found.